Ah, the weekend, the only time of the week when every-single-freaking-minute of my day is not scheduled. It’s nice to have one morning a week when I don’t have to be up and out. It gives me a chance to make something a little nice (and a little naughty) for breakfast. For that, there’s nothing like the taste of homemade cinnamon rolls – warm, yeasty, buttery bites that take a little time, but are totally worth it. The problem is – I can’t wait 2 or 3 hours while I put a yeast dough together and watch it proof twice before I bake it. And of course, I can never get my act together before the weekend to prep the dough and have it ready to pop in the oven when I get up on Saturday morning (if you are that organized, keep it to yourself – you make the rest of us feel bad). Because of that organizational deficiency, I’ve been perfecting this cinnamon roll recipe using quick bread methods over the last couple of years. This recipe is great – it gives me the satisfaction of warm, spicy cinnamon rolls in well under an hour. It’s really just my grandmother’s biscuit recipe repurposed and jazzed up. But let’s face it: the cinnamon roll is just a delivery device for the glaze. And this sour cream glaze delivers a little tang to go along with its sugary sweetness. When I first put this recipe together, I thought that it was a little too much glaze for a dozen cinnamon rolls. Then I realized: there could never be too much glaze. In a large mixing bowl, whisk together quick bread dry ingredients. Add cubed butter and cut in until the texture of wet sand. Add milk and stir until just combined. Turn dough out onto a floured surface. Knead two or three times, then roll out to a 10″ x 12″ rectangle. In a mixing bowl, toss together the filling ingredients until combined. Sprinkle evenly over quick bread dough, slightly pressing into dough. Working with the long edge, roll the dough into a log. As you roll, press firmly, but not too much. (You want an even log, not filling pushing out the ends.) Cut the log into 12 pieces about 1″ wide. Place the pieces, cut side up, onto parchment-lined baking sheet. Bake for 25 minutes. As cinnamon rolls bake, prepare glaze. Place powdered sugar, cinnamon, and salt into a small mixing bowl. Add sour cream and vanilla extract. Mix until smooth. (If you need to, you can add 1/2 t milk to thin out the glaze. 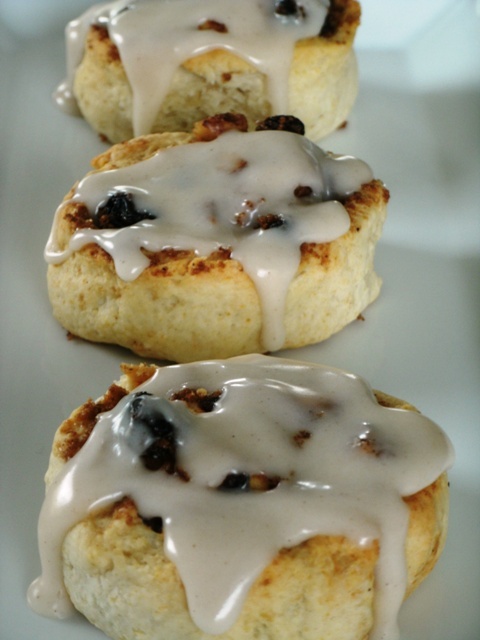 When finished baking, let cinnamon rolls rest for 5 minutes before applying glaze. This entry was posted in Cooking and tagged bread, breakfast, icing, rolls. Bookmark the permalink.